I received a really sad email yesterday from Sam at Colinette yarns saying that they’d dyed their last hank and had closed their shop in Llanfair Caereinion. Colinette is the yarn company that hooked me into knitting back in 2001. I was on holiday in San Francisco and bought a copy of Interweave Knits magazine on impulse. I hadn’t knit since I was a child and couldn’t cast off or do the perl stitch but there was an amazing looking sweater on the cover of the mag that grabbed me. It was in Colinette’s famous Point 5. At that point I didn’t even know that the company was based in Wales and dyed their yarn here. 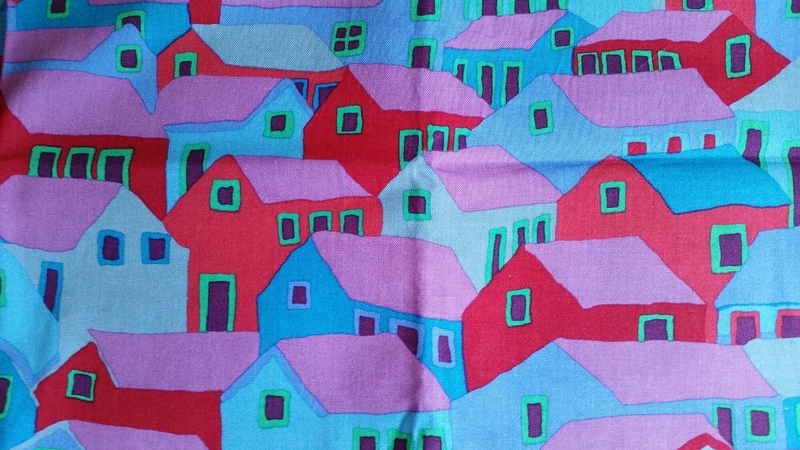 I loved reading how Colinette was an artist who had first turned her love of colour to yarn in the 1980s and had been coming up with new shades ever since. I loved her colours. I couldn’t find anything like them in Cardiff back in 2001, it sounds trite but those colours were life changing. You couldn’t buy anything knitted that was close to them back then. When I got home from SF I ordered enough of Prism, I think…, in Fruit Coulis I think.., to make a sweater. At that time I was knitting really badly. I’ve since tried to unravel the sweater and I must have split the piles or something because it’s proven impossible to undo the work but I still loved the yarn. I’ve bought so much of it over the years back when it was impossible to find a lot of the American brands that I lusted over. 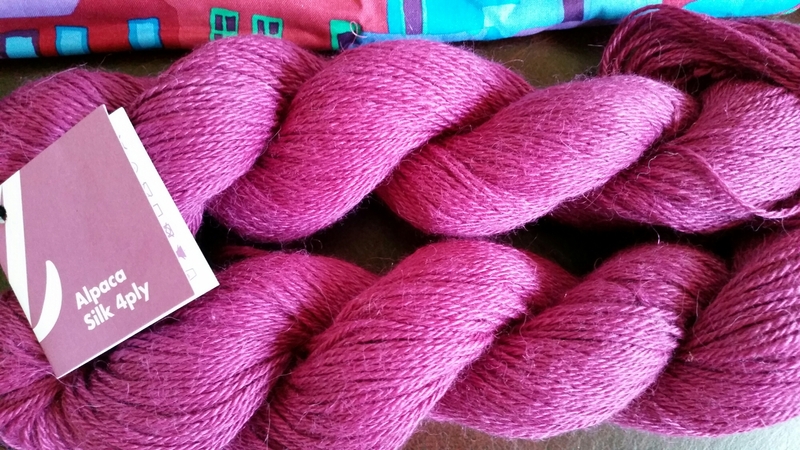 While American friends were felting Lamb’s Pride Worsted I was horrifying them by felting Colinette’s Skye Aran. 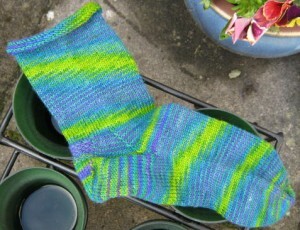 I made a fantastic pair of Theresa Vinson Stenersen’s Fuzzy Feet from Knitty in it that are worn out now. I remember going to the Knitting and Stitching Show with Jeni from Fyberspates, the first year that she sold her own yarn on the Get Knitted Stall, and being blown over by the Colinette Stand. We went there at least twice over the weekend to buy bags of yarn. Of course I still have some of it unknit! When I was with Andy we made a few trips to the fantastic Colinette shop. It was a really amazing place. Although it closed its doors early this year you can go back in time and take a tour via the magic of YouTube. There’s still plenty of yarn left in the online shop so if you’ve ever held off ordering from them this may be your final chance to do so. Today I made what’s probably my last ever order from them – One skein of Jitterbug in one of my favourite shades – Alizarine. I don’t know if I’ll knit it up straight away – I have to tidy up my craft room first ha! – or if I’ll just gently place it with the other yarns of its brethren. Colinette has held such affection in my heart as being the yarn company that swept me into the knitting world fifteen years ago and I will miss them so very much. I wish the best to Colinette and her team for the future. 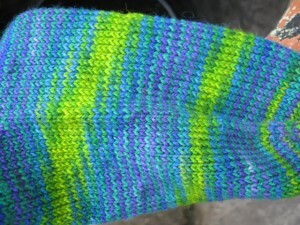 …the first sock. Will cast on for its mate tonight. Hope to have a pair by the end of the week. …because, yes. 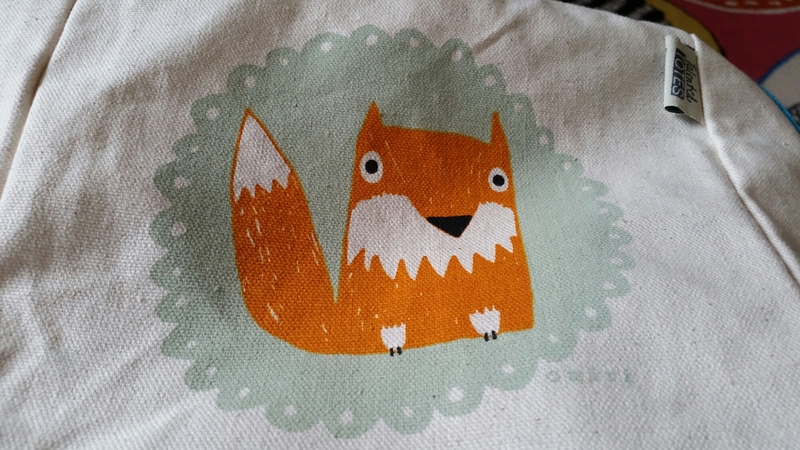 I’d forgotten about last week’s decision to try and blog on a Monday. So here’s my sock a week later. Have just been doing a little while I watch Bones – currently on season two. I’m now on the heel flap. Would have finished the flap yesterday had I not made a mistake and tried to knit it with the heel pattern instead. Had to flog 20 odd rows. Ah, well! (adopts best Rolf Harris voice) Can you tell what it is yet? There were 40 but there was a gust of wind while I was photographing them outside and I lost one! 🙁 I now have 39. I hope to find the missing one in the garden soon! Still not 100% sure what I’m going to do with them yet but they’re so lovely, I just had to order them. I love me some polka dots. Apologies for the blurry pic. 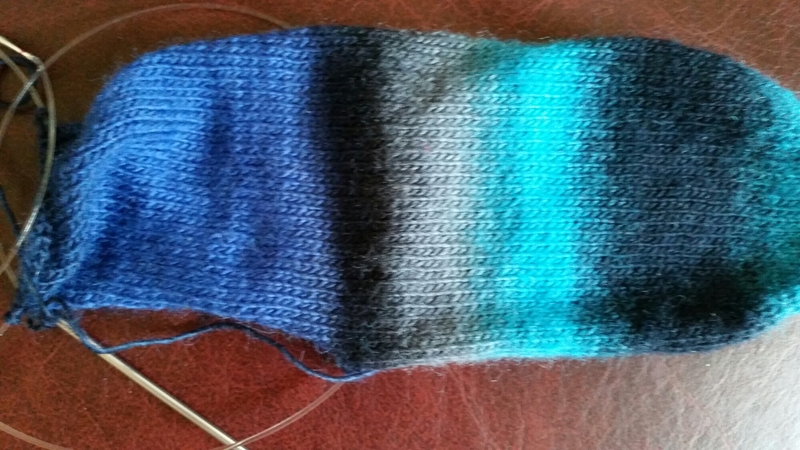 Once this is finished I’ll either cast on another second sock project or turn back to the Ysolda beret. So, the first non-bank-holiday day of my week off and I’ve been editing this month’s KnitCast and doing some baking. For years I yearned of making large, moist, chewy chocolate chip cookies.They’re easy to find in stores etc. but I wanted to make them at home. A friend of mine went to work in the United States in the early nineties and sent me home a cookie recipe book but of course it was all in American measurements and ingredients. So I was left with questions like – how much does a stick of butter weigh? I’m still not entirely sure what shortening is, but whatever it is, you can’t get it here. I remember having mixed results whenever I tried to bake cookies and then moved onto cakes and muffins which were far more successful. 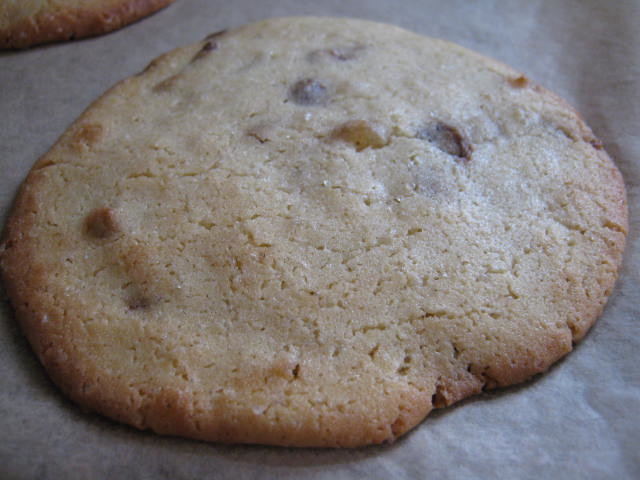 Last year I decided to bake cookies again and when I googled Chocolate Chip Cookies this recipe came up first in the list. It’s by Hugh Fernley-Whittingstall and, my dodgey oven aside, it’s foolproof. I’ve had great success with this recipe and it has relatively few ingredients. Nowadays I just use salted butter and thus you don’t need the pinch of salt. 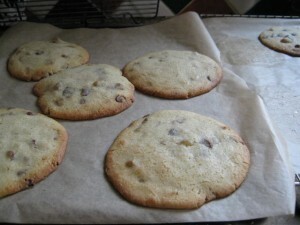 Hugh has you use the best chocolate you find and to roughly chop it but I do use chocolate chips and other ingredients. I usually slightly increase the vanilla essence either by accident, slopping too much in the bowl, or design. I also use my electric mixer to make the cookie dough so it’s even simpler. 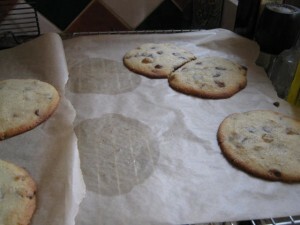 For today’s batch I used chocolate chips and chopped up some crystallised ginger that I had too. I didn’t weigh the ginger but you can put anything in these cookies. I imagine they’d be good with sultanas or cherries and coconut too. I tried to take some better photos of the Soxie sock today because yesterday’s blurry indoor pic didn’t do justice to the colours in them at all. Although I had to wait for a while because it was raining heavily. The colours are just so wild and glorious. I love them! I’ve had a knitting dilemma. You see although I want to knit more complicated things like the cabled Snapdragon Tam and the Pia Laceweight Pullover I’ve found that they’re pretty useless to take outside the house. Or rather that I’m pretty useless at working on them outside the house. I can’t knit them during my lunchbreak or on the bus etc. 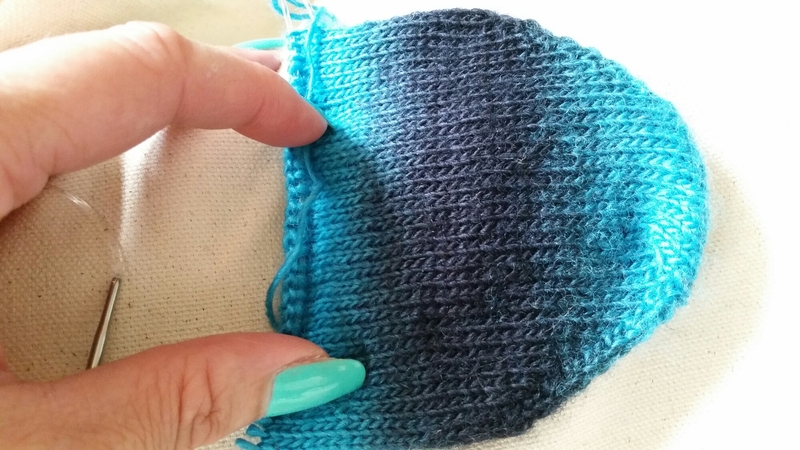 I find that those snatched moments which lend themselves so well to simple knits are not focussed enough for me to work on something that needs more concentration. I expect it’ll get easier the more confident I become with more complicated knits but I can’t tell you how lovely it felt to cast on for a sock while on the train to see Doug on Friday. As you can see it’s a second sock, so guilt free. I’m not cheating on Pia or Snapdragon with it. I bought the yarn in Sea Port Yarns during my trip to New York in 2007. The photo doesn’t do the yarn justice. The colours are green, turquoise, purple and gold. 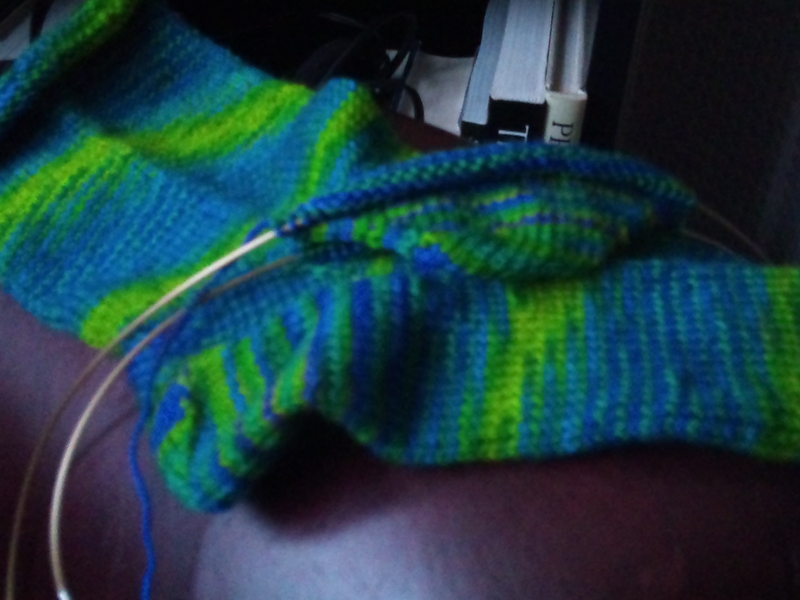 I’m not entirely sure when I cast on the first sock. It could have been anytime between 2007 and 2008. 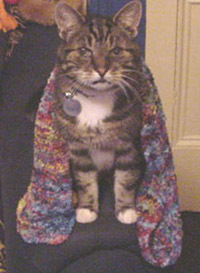 I know that I was knitting it in December 2008 just before Doug and I started seeing each other. So I cast on the second sock on Friday and have just finished the increases. It’s my usual 64 stitch sock with a partridge eye heel from The Sole Solution. I have this week off work and I hope to do some more tidying on the house, some gardening and hopefully some work n one of the more complicated knits. 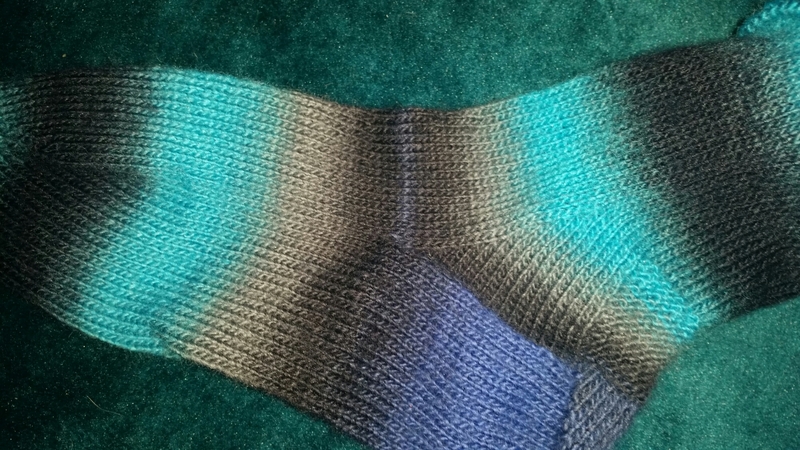 It would be lovely to get a handle back on Snapdragon and finish it despite the fact that it’s too warm to wear it. Never have I been so grateful for drafts! I wrote this post last week while I had the idea in my head. And, today while I lay here recovering from a pretty nasty bout of gastroenteritis, although I’m not sure that there’s a good kind of it!, I’m very glad that all I have to do is click “publish”. I started this blog eight years ago which now seems incredible to me. I’d had a domain name since 2000 but had never really been able to work out what to do with it. I’d had idle thoughts about having some kind of online science fiction magazine on it and sort of did that for a while. Then the site became dormant. I had thought about having a blog but wasn’t too sure what I wanted to write about. 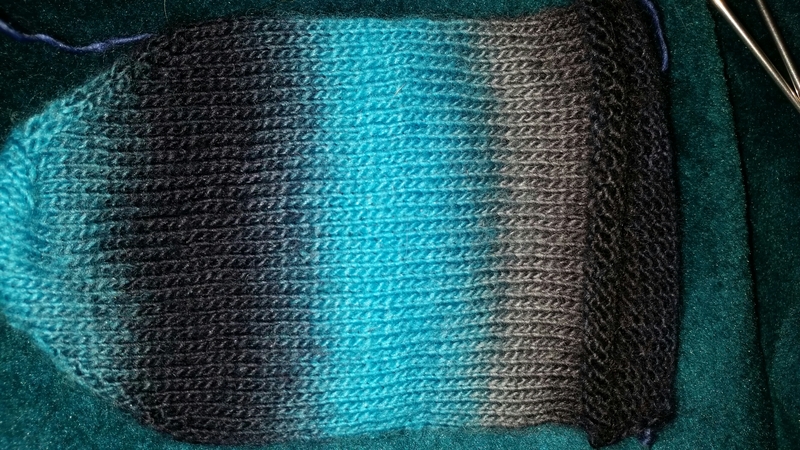 And then I discovered knitting blogs. Back in 2002 there were very few knitting blogs. So few in fact that it was possible to read them all in an evening. I was on the Knitting Bloggers webring, and indeed still am, and became friendly with my blogring neighbour Theresa who was in Chicago. It is really strange going back and reading my archives. I’ve felt a variety of emotions while going back – nostalgia, embarrassment since my writing style has changed over the years. Some things like reading about sock yarn that my late friend Anne gave me and realising that I still haven’t knit it are painful. And some things are a bit weird since I’ve had some major life changes since I began blogging. One of the hardest entries I ever had to write was where I explained about the end of my relationship with Andy. It was difficult because I tended to keep personal stuff out of the blog but people had been asking where I’d gone so I felt I had to explain my disappearance. One of the things that I’ve really enjoyed about reading the archives is hearing about some of my past cats. It was so funny seeing this picture of Clyde again. He looks so indignant wearing that scarf. Now I guess you might be wondering where some of the older archives are so that you can laugh at my earlier, dorkier stuff. The 2002-2004 ones are currently here but they look dreadful and are sans pictures. The others are over on the left in the sidebar. The blog has lived on a few servers since I began it and I’ve used three different blog platforms – Blogger, Typepad and now WordPress. I’ve been able to export the Typepad entries and comments into WordPress but the email address I used for the Blogger one is now defunct so I can’t import those entries. Also since I moved servers my old Blogger archives haven’t been behaving very well. All the comments are lost too since Enertation doesn’t appear to exist anymore. Seems weird, doesn’t it, the idea of blog software not having comments already built in but that’s what it was like in 2002. So the archives up until 2004 are quite simplistic at the moment. And I think that’s what blogging is at its heart. It’s a place to dump, a place to record, a place to remember. It’s my first Christmas at Doug’s, we started seeing each other just before Christmas last year. I’m writing this on my main present from him, a HP mini netbook in pink. It’s been some years since I’ve owned a pc but we plan to have it triple booting Windows 7/Ubuntu/iDeneb. Getting there will be a little complicated to say the least, but it’ll be fab if it works. 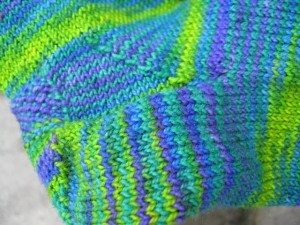 I have the first of a pair of socks for Doug on the needles and am going to start on an Urchin Beret today. The yarn I’m using for that was handspun for me by Jeni quite a few years ago. It’s thick and thin and in beautiful purples and turquoises – again, photos coming soon! I’ve been saving it for the “perfect project”. Not always the best thing to do because we can hung up so much on prefection that we never actually produce anything. I don’t tend to do New Years resolutions because I feel that you should be able to make changes in your life at any time rather than just at the beginning of the year. However, next year, I’d like to use some more of the materials I’ve been hanging onto for too long. That includes cutting into the Taj Mahal tapestry fabric I bought from eQuilter a long time ago. I’m still not sure what I’ll use it for, and I think I only have a metre of it, but it’s been in my stash too long. Any suggestions on what to use it for would be gratefully received!